Intel has started a beta test of Optane DC Persistent Memory for OEM customers. Together with the beta, the chip giant has also introduced two different operating modes for the 3D Xpoint based memory. In Memory Mode, Optane works like DRAM, where data is gone when the system is powered down. In App Direct Mode, the data remains stored even when the system is powered down. The beta test of Optane DC Persistent Memory has started with DIMM models that are DDR4 pin compatible. Modules are available in capacities of 128GB, 256GB and 512GB. Potential OEM customers, that are part of the beta, are able to provide access to the new technology to their customers. General availability of the technology should be in the first of half 2019. Optane DC Persistent Memory now features two different operating modes which can be set through the BIOS or through a memory management tool. 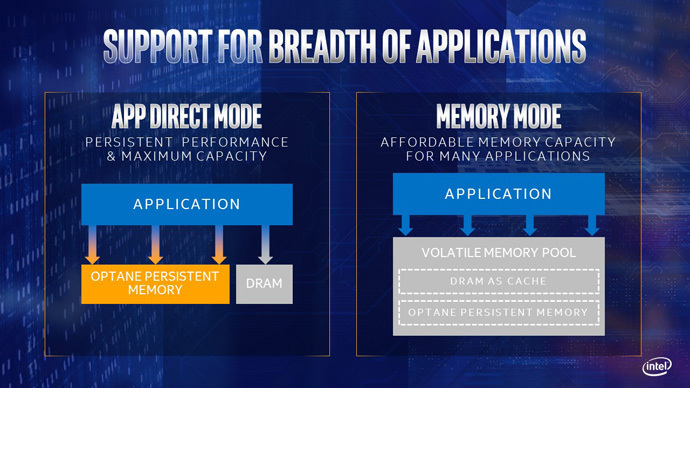 In Memory Mode, the Optane DIMMs serve as cost-effective DRAM replacement. To applications the Optane memory is presented as volatile memory, just like on DRAM-only systems. In reality this is a combination of Optane and DRAM, where DRAM acts as a cache for the most frequently-accessed data, while the Optane persistent memory provides large memory capacity. The setup is slower with random access workloads than on DRAM only systems, but allows for higher capacity memory and is more cost effective. In this mode data is volatile, which means it’s lost when the system is powered off. In App Direct Mode, applications and operating system are aware that there are two types of memory available. The system will decide whether to write or read data from either DRAM or Optane persistent memory. Operations that require the lowest latency and don’t need permanent data storage can be executed on DRAM. Data that needs to be made persistent or structures that are very large can be routed to the Optane persistent memory. In this mode, data remains in memory even when the system is powered off. For App Direct Mode a file system that can handle Persistent Memory is required. Currently only Microsoft Windows Server 2019 is compatible. Also, an upcoming update of VMWare ESX 6.7 should work with the new mode. Later the technology should also work with Linux.